The discrete element method (DEM) together with the finite element method (FEM) in LS-DYNA was employed to investigate the dynamic behaviour of sand under impact loading. 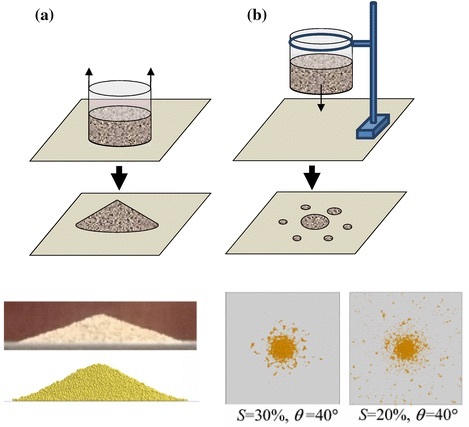 In this approach, the partially saturated sand was modelled in DEM with capillary forces being taken into account through an implicit capillary contact model, while other solids were simulated using FEM. A slump test was first performed with dry sand to calibrate the contact parameters in DEM. Low velocity impact tests were then conducted to investigate the effect of water saturation on the shape and height of sand piles after impact, and to validate the simulations. It was found in the experiments that an increasing water saturation (in the range between 10 and 30 %) affected the height of sand pile for a given drop height due to an increasing cohesion between particles. The simulations captured the experimental ejecta patterns and sand pile height. Finally, a low confinement split Hopkinson pressure bar test from earlier literature was modelled; the DEM–FEM simulations could reproduce the trends of experimentally observed stress–strain curves of partially saturated sand under high strain rate loading, indicating that it was feasible to model dynamic behaviour of dry and wet sand with low saturation (<20 %) in LS-DYNA; however, a number of questions remain open about the effect of grain shape, grain crushing and viscosity. This entry was posted in Publications and tagged capillary force, DEM–FEM, discrete element method, LS-DYNA, partially saturated soils. Bookmark the permalink. Post a comment or leave a trackback: Trackback URL.